In 1957, I had just reached the age of twelve years and began to contemplate my future. Or, as was the common expression in those days, “what was I to become when I grew up”. Adult men in the deep south back then were defined by how they earned their living. In the backwoods of the Appalachian mountains in the mid 50′s, farmer, trapper, blacksmith, and laborer were perfectly honorable professions and the vocation of choice for most of my schoolmates. My parents were very poor and lightly educated; my father never graduating from high school. Their history however, did little to deter them from pounding the ethic of hard work and education into the heads of my younger brother and me. My father worked two jobs in the nearest town, some thirty miles away, and tended our small thirty acre farm during his rare time off. In his absence, our mother took over working the farm with her staff of two pre-teen sons. Hard work – seven days per week – did not pose any hardship on my family. It was simply the price of not starving to death. Studying hard in school, even the two hour round trip school bus ride, was no imposition either. School work provided an escape from the daily grind of digging weeds from the vegetable garden, carrying buckets of water to the hog lot, clearing land of pine saplings to plant hay for our single cow, milking that cow and feeding the chickens. When I entered junior high school, my mandated study routine became more than just a way to please my parents – it became a portal to another world I never knew existed. My classmates in the 7th grade fought over the school library’s National Geographic magazines in order to get their first glimpse of a woman’s breasts from photographs of African girls. I found them fascinating as well, but for me, there was so much more to experience. I was mesmerized by… the photographs of exotic places like Bora Bora, St. Moritz, Rio de Janeiro, the ancient cities of Japan, even the surface of the moon. While I spent hours chopping weeds in a five acre patch of corn, I would day-dream of travelling to such places - but freely admit an occasional drift back to the images of the African girls. The fact that my family had no money and was deeply in debt did not reduce the realism of my dream to travel the world. 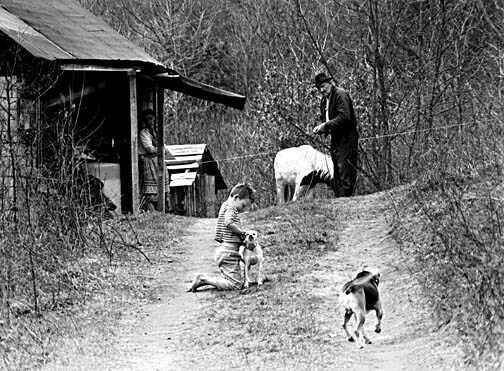 I wanted to experience everything the world had to offer and to escape the abject poverty of Appalachia, with its constant threat of tuberculosis, deformed children of inter-family coupling, a stifling fundamentalist religeous community, and a mind-numbing ‘same-ness’ that drained the possibility of a better life from all of us. In school, I learned about men who had a life like the one burned into my thoughts. These men had earned fortunes by investing in real estate. My father preached the wisdom of land ownership, even though his single real estate ‘investment’ was more about growing food than earning profits. Plus his ‘real estate portfolio’ consisted of this thirty acre dirt farm, burdened by a mortgage debt of 95% of the price he paid for it, plus another 3% he borrowed from friends that the bank did not know about. In other words, we owned only 2% of “our” farm. Then one day it all turned around for me. A day that is burned into my memory as clear as the day I graduated from college, the day I bought my first car, and the first time I ever crossed an international border. One of the companies my dad worked for held a picnic on the 4th 0f July. All the company’s employees and their families were invited to a public park where hot dogs and hamburgers were served while company men would play folk music on their guitars, banjos and fiddles. Three-legged races, egg tossing, softball games, and horseshoe tournaments entertained these blue collar families until late in the afternoon. The final activity of the day was to be the ‘coup de grace’ of the entire event. And it was. The company management had hidden a half dozen silver dollars in a large sand box. They assembled all pre-teen kids in a line some twenty yards away from the sand box and announced that the silver dollars would belong to whoever could find them. And with that, a shout of “GO” produced a mobile chaos not seen since the Oklahoma land rush. Some thirty kids reached the sandbox almost simultaneously, some diving in head first. I have witnessed hurricanes in South Florida that put less sand in the air than those thirty kids. The sight, reminiscent of thirty starving dogs digging for a single bone, sent howls of laughter through the adult parents cheering on their kids. When a kid found the first of the silver dollars, the intensity of the dig was amplified tenfold. Up to that point, the idea of actually owning a real silver dollar was somewhat abstract. But now, it was real!!! Even in his most bloodthirsty campaigns, Attila-the-Hun never attacked a target as violently as those kids attacked that sand box with it’s remaining five silver dollars. Sweat and spit mixed with bloody noses as several fights broke out. Some kids were screaming because of sand in their eyes, some were being smothered by other kids piling on top of them, and one kid even resorting to pulling others out of the sand box in an apparent attempt to ‘thin-the-herd’. Another silver dollar was unearthed by a kid with most of his shirt torn off – and then it happened – my kid brother found one. Then a fourth piece of the booty left the battlefield. Only two dollars was left of what was surely my eventual ticket to Bora Bora. And then, there it was. Silver dollar number five, exposed by two other kids who were kicking each other in the stomach. I quickly snatched it, thinking that a kick in the forearm was a small price to pay for such a treasure, and quickly exited the field of battle. For the next three days my kid brother and I pondered the disposition of our new found fortune. We discussed the purchase of candy, soft drinks, and all the other things coveted by young boys that could be acquired for one dollar. Then it hit me. Why don’t we invest it? Better yet, why don’t we invest it in real estate? Perfect! But where can we buy real estate for two dollars? Who do we know that would be willing to sell us a piece of real estate for two dollars? Alcoholics, who have successfully completed rehabilatation, say that their return to normal life began with, what they term, “a moment of clarity”. I had one of those moments when I discovered I already knew a guy who would sell us some real estate for two dollars – my dad. My brother and I approached him with a proposition. We would pay him our hard-fought two dollars for a small tract of land in a field next to the house. My father sensed a ‘learning opportunity’ and began an intensive negotiation regarding the desirability of the location and the size of the plot he would sell us for two dollars. After two days of intense negotiations, rivalled only by contract negotiations between General Motors and the United Auto Workers Union, we settled on a plot near the corn field, two square yards in size. Price – two silver dollars. We even produced a bill of sale and a deed for our dad to sign. We had become ‘landed gentry’. More importantly, we carried no mortgage on our property. Could untold riches be far behind? My brother and I now owned one square yard each, of rough-scrabble Tennessee farm land, much more suited for growing rocks than any edibles. But it was ours. We set about establishing boundaries between ‘our land’ and our ‘father’s land’ with a yard-stick incremented into 1/16th of an inch. We then established measured boundaries between my brother’s square yard of land and mine. I doubt that the border between Israel and Syria is better marked. That night, flush with new title of “Land Owner”, we took an old piece of canvas from the barn our dad used to cover soil tilling equipment, spread it across our land, and spent the night – accompanied by a few black snakes, fire ants and the occasional rain storm. No matter. We were the Volunteer State’s newest real estate investors. Life in the Appalachian Mountains has few happy endings, and neither did ours. Not long after my first real estate acquisition, my dad declared bankruptcy and we lost ‘our’ farms. But what I took away from that experience was much more valuable as I climbed out of poverty and reached a measure of affluence in adulthood. Recently, as I was telling this story to my wife, a thought occurred to me. My dad paid $4,000 for that farm, or about $133 per acre. A little research reveals that there are 4,840 square yards in an acre. My brother and I bought two square yards of land for $2. In other words, we paid the equivalent of $4,840 per acre – valuing the $4,000 farm my father bought at $145,200!!!! No doubt, the most lucrative investment he ever made. My father passed away forty-three years ago, and he is still teaching me lessons.